This whole article is nothing but Infinity War spoilers. Take the bifrost back to our spoiler-free review if you haven’t seen it yet. You lose some, you lose some. The Marvel Cinematic Universe celebrated its tenth birthday with its characteristic action-packed, character-driven storytelling. 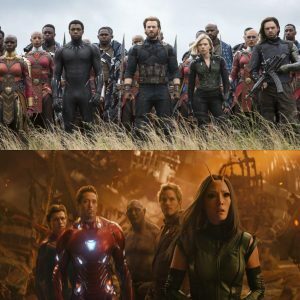 Nineteen films and dozens of characters have shown that Marvel has a remarkable flair for the dramatic, but also an impressive proficiency with deep, interconnected, long-running continuity. But with Infinity War, they’ve also proven that they’re not afraid of taking risks. Ending the story on a downer note, for instance. Killing off dozens of beloved characters in a single, senseless snap. But perhaps most of all, instead of casting the protagonist as one of the heroes we’ve spent a decade coming to know and love, this story centers around the bad guy. And not just a bad guy, but the bad guy; Thanos has been the looming shadow of evil over the first ten years of the MCU, and when he finally shows up in force, we actually get to see the universe from his perspective. The Avengers, the Guardians of the Galaxy, the various characters who have populated this universe since 2008– while they’re still heroic, they’re not the heroes of the film. To Thanos, and to this film, they’re antagonists. Okay, so this isn’t exactly a hot take. But not only is Thanos the protagonist of Infinity War, his characterization is also informed by all of the MCU’s prior protagonists—particularly Iron Man, Hulk, Thor, and Captain America, the original four Avengers. 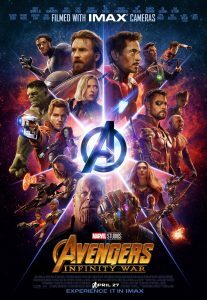 Thanos’ journey is a trek back through the last ten years of the MCU, all culminating in the final survival of the four heroes who began it all; while his snap metes out its terrible, swift, capricious judgment upon the rest of the universe. In a warped, twisted way—and against Loki’s explicit assertion that he wouldn’t—Thanos has assumed the mantle of God. And with it, he has claimed for himself the Godlike elements of prophets preaching purpose, the sacrifice of his progeny, and a plan of final salvation for all. Just, like I said, in a perversely warped way. 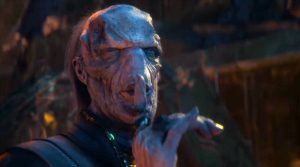 When Thanos’ children, the Black Order, make landfall onto a planet, they’re not merely executing his orders dispassionately. They fully believe in his plan and the nobility of its purpose. So much so, in fact, that they seek to “preach” this purpose. Hear me, and rejoice. You have had the privilege of being saved by the Great Titan. You may think this is suffering; no, it is salvation. Universal scales, tipped toward balance because of your sacrifice. Smile! For even in death, you have become Children of Thanos. In true Old Testament fashion, the Black Order preach joy, salvation, repentance, and judgment. They promise meaning and fulfillment from Thanos; they promise membership and belonging, and a connection to something greater than the individual. But above all, they preach purpose; your lives have served a purpose, your death will serve a purpose. You were meaningless before, but now you are part of a grand purpose. And yet this gospel of Thanos is lacking. Its purpose is a putrid shadow of the purpose it seeks to supplant. In it is no joy, or hope of true salvation. Its promises are lies. This pursuit of purpose is certainly not exclusive to Thanos, or to the Infinity War films; the story arcs of Thor and Iron Man, in particular, are all about their main characters discovering and living up to their purpose. Thor’s story arc is about the God of Thunder discovering that his purpose is to be the King of Asgard; not the warmongering, tantrum-throwing, capricious king of a planet, but the sacrificial, steady, and compassionate king of a people. From the first Thor film through Ragnarok, we see him learning the demeanor and care that will be required for him to take the throne. Tony Stark’s purpose, on the other hand, is peace. 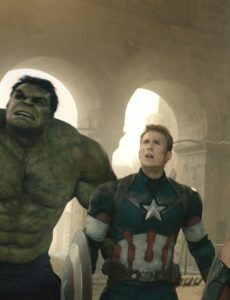 In his standalone films, he pursues peace through getting weapons out of the hands of bad guys and into the hands of those who could help; in Age of Ultron, his rallying cry with Bruce is “peace in our time;” and in Civil War, his pursuit of peace leads him to a direct confrontation with Captain America. Now, in a way, Thanos pursues the same purpose as both of these men, but in a warped way. He seeks to rule everyone, but through force and fiat, not through compassion; rather than laying down his life to save them, he would destroy half of them to save the other half. He also seeks peace and prosperity, but it is a peace through destruction and devastation, a disarmament through declaring war upon the peoples of the universe. I have set the LORD always before me; because he is at my right hand, I shall not be shaken. Therefore my heart is glad, and my whole being rejoices; my flesh also dwells secure. Where Thanos tasks his people with annihilation, Jesus seeks adoration. Where Thanos gives purpose only in death, Jesus gives purpose in life; a life lived in glory and love for the One who saves. The purpose that Thanos calls his “children” to is disgusting: “be annihilated so that I can save the universe.” That way lies no glory, no salvation, no joy. That way lies no purpose. And, while it may seem to bear some superficial similarity to Jesus calling His people to take up their cross, the details prove it couldn’t be further from the truth: it’s actually a forced sacrifice. 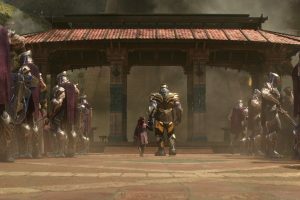 Thanos’ plan to gather the Infinity Stones and “save” the universe hits a snag when he finally manages to find the location of the Soul Gem; for, as the Red Skull tells Thanos, “the stone demands a sacrifice.” And, though Gamora is not the first casualty of the titan’s quest, she is undoubtedly the one who affects him the most. Since Hulk is essentially invulnerable, “sacrifice” usually means something different for him. He sacrifices a relationship with Betty Ross and potentially a cure for his Gamma poisoning in order to defeat Abomination in The Incredible Hulk; he sacrifices his anonymity and his secret lifestyle of humanitarian aid to defeat Loki and the Chithauri in The Avengers; he puts himself in exile in hopes of saving Natasha from another mind-controlled rampage in Age of Ultron; he transforms into Hulk, knowing that it may mean he’s sacrificing his ability to ever turn back, in order to help Thor save Asgard from Hela’s beast in Thor: Ragnarok. And in Infinity War, he tries to lay down his life to save Asgard from Thanos. It’s a very unconventional story of sacrifice, as he sacrifices greater and greater pieces of himself in order to save others. Captain America, on the other hand, has had a much more traditional relationship with the sacrificial narrative. From the very beginning, he’s been the one willing to sacrifice himself for the good of his teammates; diving onto a grenade to save the lives of other recruits, personally ditching a dangerous plane in the arctic to save millions. In The Avengers, he chastises Tony for not being the kind of guy to sacrifice himself for others (a claim proven untrue by the end). He’s always quite clear in wanting to be the first one in and the last one out; he is steadfastly committed to saving lives, even if he must oppose his own government to do so. This is why, by the events of Infinity War, he refuses to let Vision sacrifice himself until they’ve exhausted all other options. 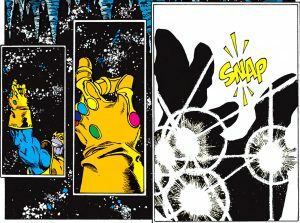 Cap’s “we don’t trade lives” doctrine, right or wrong, stands in stark contrast to Thanos; it also leads directly to Thanos acquiring the Mind Gem, and finally gaining the ability to enact his snap. Against his doctrine and against his will, he has made the ultimate trade of lives: half of the population of the universe, traded for the other half. But, of course, Thanos’ greatest personal sacrifice is his “favorite daughter,” Gamora. The reason I called this “almost Biblical” is that, while God also sacrifices His child to save the universe, Gamora is unwilling, and unbelieving in her father’s vision for salvation. Although, at first, it might seem like Jesus isn’t on board. For the joy that was set before him [Jesus] endured the cross, despising the shame, and is seated at the right hand of the throne of God. Jesus’ sacrifice is voluntary and willing. He is on board with God’s plan. He pursues the salvation of the earth for the joy of rescuing His people. Unfortunately, Thanos thinks he’s doing the same. Every villain thinks he’s the hero of his own story, but Thanos thinks he’s the thankless hero of everyone’s story. During his monologue, he explains that the world he came from was torn apart by overpopulation, by a mad scramble for resources that set the planet’s population to a war that ended with their destruction. The ruins of Titan surrounding him, he explained his furious devotion to preventing this from happening again. And so, in order to stop billions from dying, Thanos kills billions. In order to ensure peace, he embarks on the most destructive war in history. To secure freedom, he denies a choice of fate to everyone in the universe. But what happens after? What happens when the population recovers? Is he to snap his fingers every few millennia, maintaining balance through regular bloodbaths, like a jazz musician keeping time? His “salvation” is death now, and a promise of more destruction, more death, and more loss, extending on into infinity. It’s a bleak future. This is what separates Thanos from the Avengers. Because the MCU has a morality, and it states that killing innocent people is wrong, for any reason. Captain America, Thor, Iron Man, and the Hulk have proven for ten years that they will fight with all their resources against those who seek to kill innocent people. 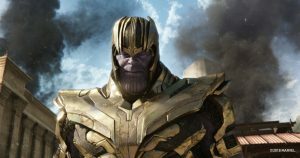 Further, Thanos’ “salvation” is destructive; far from welcoming everyone into his salvation, he condemns half of life itself to annihilation in hopes that the other half may be saved. It’s the opposite of the MCU morality, and it’s the opposite of the morality we see in the Bible. But Thanos thinks he’s a god. He thinks he knows better than the morality of everyone else in the universe, better even than logic itself, because he thinks that there’s a tough decision that only he can make. Some of the most terrifying villains, in fiction and in reality, are the ones who reach up toward God’s great heights but miss the mark. Satan himself is the prototype of this type of villainy, reaching toward God in splendor and power but falling far short in the act. In a way, every villain in fiction is like this, but Thanos’ plan echoes more closely and in a more dissonant way than usual. And so, when Thanos reaches out to grasp the mantle of God, with all the responsibilities and power that comes with it, he demonstrates the definition of sin. The same sin we bear. If you’ve been reading Redeeming Culture for a while, you know that in the metanarrative of our lives, we’re almost never the main character – but we are here! He assumes the place of God, reaches out for God’s power, and the destruction that results is unimaginable. We are Thanos, reaching for Godhood, trying to be like the Holy One, but failing and falling short at every turn. Our plans are twisted and perverse. Our methods are clunky and ineffective. Our plans only destroy. The funny thing is, the Bible does call us to be like God. We are called to be perfected by the law written by God upon our hearts, by the Holy Spirit speaking to us in covenant and promise, and by the singular, once-for-all sacrifice Jesus gave on the Cross. Rather than coming up with our own destructive plan, we’re called to be a part of His; to join Him as He saves the world from the sin and destruction. Perfectly, peacefully, and without the capricious snap of an Infinity Gauntlet. Our sin brought destruction upon the world. But Jesus has come to remove it. I think there’s a clue to the theme of Avengers 4 in the scene where Stark explains the “Avengers” name to Loki in 2009’s The Avengers. 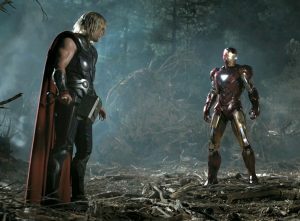 If the first Avengers film was about protecting the Earth, I bet the next one will be about avenging it. Not against Loki, but against Thanos. Thanos’ plan is undeniably evil. It’s destructive. Its ends are horrible. No matter what his intentions are, the way he pursues them is not heroic. He may be the protagonist of Infinity War, but he’s no hero. And the evil things he’s done need to be avenged. It matters why we do what we do, and it matters how we do it. But our own Avenger has great intentions, and a great plan to accomplish them. The thief comes only to steal and kill and destroy. I came that they may have life and have it abundantly. I am the good shepherd. The good shepherd lays down his life for the sheep. […] I know my own and my own know me. See here, Jesus also promises joy, and salvation, and fulfillment, and meaning. He promises that we will find purpose in knowing Him. He offers Himself as a perfect sacrifice to protect us from the death we’re due for our treason. And He accomplishes a final and complete rescue, avenging our death and destruction upon the sin that has held us captive our entire existence. But He also gives hope: that we don’t have to save ourselves, that the end goal won’t be something that kills us. His prophets, His sacrifice, and His plan are all promises of life, an abundant life; of protection and vengeance for His people. And he didn’t need to kill half of the universe to deliver on that promise. In fact, He didn’t need to kill anyone. He only needed to lay down His own life. This entry was posted in Superheroes and tagged Avengers, Avengers: Infinity War, Captain America, Iron Man, marvel, Marvel Cinematic Universe, The Incredible Hulk, Thor. Bookmark the permalink.